Negar Kharkan is a virtuoso of the Kamancheh, a composer and an author. She is renowned within Iran and the diaspora as being one of the most gifted Persian classical musicians of her generation and is unique in being the only musician in Iran, female or male, to have worked with all the most acclaimed Persian classical Maestros and ensembles: Maestro M.R. Shajarian,Maestro Dariush talai,Maestro Ardeshir Kamkar, Maestro Sh. Nazeri and Maestro Hossein Alizadeh. Negar Kharkan has performed in some of the most prestigious concert halls around the globe on numerous extensive world tours. 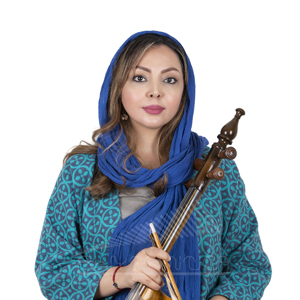 In 2016 her album released as ‘That Bewitching Black’in Iran and her iBook,(The kamancheh Method ), created by Negar Kharkan and The Rhythmitica Academy. Shahnaz Ensemble (Maestro M.R. Shajarian), Kamancheh & Sorahi Soprano player (European tour 2014). Ardeshir Kamkar group, Zehi Eshgh Ensemble, Kamancheh player (Kermanshah & Tehran, Iran 2014). Molavi Ensemble (Maestro Sh. Nazeri), Kamancheh player (Tehran, Iran 2014). Shams Ensemble (Purnazeris & A. Ghorbani) Kamancheh player (Iranian tour 2011). Shahnaz ensemble (Maestro M.R. Shajarian), Kamancheh & Sorahi Soprano player, 2010 (London 2010). Molavi ensemble (Maestro Sh. Nazeri), Kamancheh player (Iranian tour 2008). HamAvayan ensemble (Maestro Hossein Alizadeh), Kamancheh player, 2006-2007 (Tehran Iran). Shams ensemble (Pournazeris & A. Ghorbani) Kamancheh player, Kurdish music festival 2005. Vesal ensemble, Arjang Seyfizadeh (Tehran & Shiraz, Iran and Sulaymaniyah Iraq, Kurdsat television 2005). Kurdish Music Festival, Kamancheh player, solo performance (Iraq: Sulaymaniyah, Kurdsat television 2005). Music Conservatoire, Tehran- Iran, 2002-2008: Kamancheh. Art & Architecture University, Tehran- Iran, 2008-2010: Kamancheh. Pars Music Institute, Tehran- Iran, 2006-2008: Kamancheh. Shams Music Institute, Tehran- Iran, 2010 - Present: Kamancheh. ‘An Siah E Afsoon Kaar’ (That Bewitching Black), Composer: Negar Kharkan, Kamancheh: Negar Kharkan (CD album, released by Javan recordings, 2016). ‘Gypsy’, Composer: Maestro Ardeshir Kamkar, Kamancheh: Negar Kharkan, (Single Track released by Musicema, 2014). album, released by Delawaz, 2013). album, released by Mahriz recordings, 2012). album, released by Barbad Music, 2011). Kamancheh: Negar Kharkan (CD album, released by Delawaz, 2010). Kharkan (CD album, released by Irangaam, 2010). released by Aye Novin E Isfahan, 2009). album, released by Delawaz, 2009).